150 years after the Battle of Kennesaw Mountain, a look back on the impact this event had on the community. Warfare Illustrated: Gen. Sherman’s troops |!! !|advance toward Marietta. This Harper’s |!! !|Weekly illustration by Theodore R. Davis |!! !|appeared in print the week of July 30|! !| 1864. Boom, Boom, BOOM! I was describing the Civil War Battle of Kennesaw Mountain – fought 150 years ago this month – to my 5-year-old grandson, Holden Young, on a recent beautiful summer day. We were standing at the site of a cannon emplacement on land that was owned by his great-great-great-grandmother Annie Young Wilson. To her grave at age 98, she believed that she, along with two other families, were cheated out of their farm property when the government paid them $50 an acre to purchase the land for Kennesaw Mountain National Battlefield Park in 1935. Yet the park has been a marvelous thing for our Georgia community, bringing thousands of visitors each year. In fact, it’s one of the most popular Civil War parks in the country, hosting more visitors than even Gettysburg National Military Park. It was a strange war that gave us Dixie, the South’s fight song written by a Yankee, and the North’s anthem, The Battle Hymn of the Republic, based on a Southern plantation chant. Stranger still, to this day, Americans have not been able to agree on the name for our Civil War, much less on why it happened. In Vermont they call it the War of Rebellion. I grew up in Cedartown, Ga., where we called it the War Between the States. But, no matter what name it was given, the war gave birth to fierce loyalties that remained for decades – and in many cases to the present day. My Aunt Ida was horrified when I was in college in 1964; I said I would vote for Republican Barry Goldwater. “You don’t understand, they are the other side,” she said. “Yankees are Republicans.” I quickly changed my mind. As the sesquicentennial of the Civil War rolls across Georgia, it’s my turn to help the next generation try to make sense of our history. Little did my grandson know he was standing on ground where 150 years ago Gen. William T. Sherman’s 100,000 Northern blue coat troops were positioned around Kennesaw Mountain, just outside of Marietta, ready to charge Gen. Joseph E. Johnston’s 50,000 gray-coated Confederate soldiers, who were dug in at the top of the area’s highest mountain. Sherman didn’t say, “War is hell, and I will make it so.” But he did say, “I will make Georgia howl.” This famous quote was actually said about his later Georgia “March to the Sea,” because at this battle Sherman felt the full blue steel of the Confederate Army. Still, the battle and its aftermath were very important to our history. They had a significant effect on the freeing of the slaves and on keeping the United States of America as one country, undivided. The battle is being commemorated in Marietta and Kennesaw with many events and speeches throughout the month of June to tell the story. These events are called a commemoration, not a celebration. How could we celebrate the madness that cost our country more than 750,000 dead, more than World War I and World War II combined? The Civil War is a fascinating subject that has produced more written words about it than any other war. I ran across some of the earliest words written about the war last year at an antiques estate sale when I discovered old newspapers bound together by string. The papers turned out to be an original set of the 1864 Harper’s Weekly, the pictorial weekly that dominated the national scene in that time much as USA Today does in our time. The pages follow Sherman’s campaign in Georgia with beautiful pen and ink illustrations by artist Theodore Davis, who risked his life drawing the battles in real time. The 1864 campaign against Atlanta began in May in Tunnel Hill, north of Dalton, with a series of flanking maneuvers against Johnston, each of which compelled the Southern army to withdraw from fortified positions and dig in down the line for 70 miles. There were battles at Resaca, Allatoona Pass south of Cartersville, Pickett’s Mill, New Hope Church and Dallas. Two months after Sherman left Dalton, on June 27, 1864, when his path was blocked by the imposing fortifications at Kennesaw Mountain, the general chose to change tactics and ordered a full-scale assault. 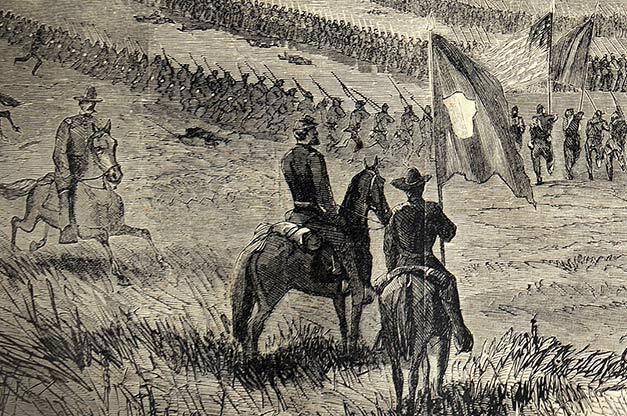 The Federal Army moved from Dallas east toward the base of Kennesaw Mountain. Sherman said in a dispatch, “Kennesaw is the key to the whole country.” Johnston’s gray coats dug in at least 50 miles of connected trenches in what was one vast fort. Sherman’s plan was to thin out and weaken the gray line. He ordered Maj. Gen. James McPherson, for whom the U.S. Army’s Fort McPherson is named, to assault the northern end of Marietta and the northeast side of Kennesaw Mountain, almost the same spot where my grandson and I stood, 150 years later. Federal Col. Oscar Harmon was next in command, and within five minutes he was shot through the heart. Another brigade on the right took similar losses. Overall, in just 30 minutes of fighting, the battle sent 397 Union troops to their death. Both sides later called this place Dead Angle. Sherman asked Gen. George Thomas to renew the assault. Thomas, known as the “Rock of Chickamauga,” knew that more than 4,000 men had been killed in just a few days of fighting. “One or two more of such assaults would use up this army,” he said. The only success of the day for the Federal forces came when two brigades from Gen. John Schofield’s Army crossed Olley Creek, just north of where the Cobb Galleria Centre is today, without resistance. That movement, along with the Army of Maj. Gen. George Stoneman’s cavalry, put the Federal troops within five miles of the Chattahoochee River. The Battle of Kennesaw Mountain was considered a significant Union defeat, and after the Dead Angle assault both armies spent five days in the hot sun facing each other at close range. On July 8, Sherman withdrew and moved south of Johnston’s left flank. Johnston was forced to withdraw from Kennesaw Mountain and move south past Marietta to Smyrna. Sherman’s army entered Marietta and set up camp. He could soon see across the river to where Atlanta stood as pretty as a blue-eyed Southern lady. It was the ultimate prize for Sherman’s army. Sherman had forced the Confederates to move to a new position and leave the Chattahoochee River unprotected. The last major geographic barrier to entering Atlanta had been removed. On July 9, after Sherman outflanked Johnston, he sent Gen. Schofield across the Chattahoochee near the mouth of Soap Creek, just north of what is now I-285 near Powers Ferry Road. Confederate President Jefferson Davis relieved Johnston of command on July 17 because he was alarmed with the strategy of continual withdrawals. He liked the far more aggressive John Bell Hood, and yet Hood proved to be a disaster for the Confederate cause. Hood used his 50,000 troops to make frontal attacks against the Union’s 100,000 battle-hard soldiers. The grey coats suffered enormous casualties in the Atlanta battles of Peachtree Creek, Atlanta/ Decatur and Ezra Church between July 22 and July 28. Sherman spent August be-sieging Atlanta, and then sent his Army south to Jonesboro to cut the railroad line into the city. There, Hood attacked the Union forces again on September 1, but was unsuccessful. This was the last gasp to save Atlanta, and after admitting defeat, Hood withdrew and moved his forces northwest up through Youngs Station, Cedartown and Rome, and into Alabama to regroup and lick their wounds. On September 2, Sherman telegraphed President Lincoln, “Atlanta is ours, and fairly won.” It was a major victory that had more impact on the North than Gettysburg. It meant that the Union would win, even though it would take another seven months of hard fighting before Lee surrendered at Appomattox. Before Atlanta, Lincoln’s chances of being re-elected were not looking good. The voters in the North were tired of the fighting. There were thousands of mothers mourning the loss of their sons, who had been at war for three long years. Almost all of the battles, save Gettysburg and Vicksburg, had been won by the Confederate armies. And Southern Gen. Robert E. Lee was almost as popular as Lincoln, even in the North. The Republican Party faced an election against the Democrats’ popular peace candidate George B. McClellan. McClellan was a Yankee general who had been relieved of duty because Lincoln felt he was too timid to lead the Army of the Potomac. McClellan personally didn’t believe in his party’s platform – a negotiated peace that would restore the Union with slavery – but there were powerful forces in the north who wanted to sue for peace. This platform was a major issue in the 1864 election, and Democratic popularity was increasing when Union armies were doing poorly, which was most of the time. If the Democrats had won the election over Abraham Lincoln and also controlled the U.S. House and Senate, this nation could have kissed the Emancipation Proclamation goodbye. Or even worse, we would have been divided into two countries, the United States of America remaining free, and the Confederate States of America with slaves. Because of a little flanking action at the end of the battle of Kennesaw Mountain, where Federal Gens. Schofield and Stoneman led a movement to the edge of the Chattahoochee River, Sherman saved Lincoln’s chances of being defeated in the upcoming election. After the Northern Army crossed the river, it was all over. The March to the Sea was wide open for Union troops, and Sherman made Georgia howl. The fall of Atlanta was big news in Harper’s Weekly and other newspapers in the Northern states. Church bells tolled in celebration all over the country. In the national election on Nov. 8, 1864, Lincoln and the Republican Party won by a landslide. And the Emancipation Proclamation walked into history. For my grandson, Holden Young, we are still one nation, undivided, with liberty and justice for all. Special thanks to Michael Shaffer, assistant director of the Civil War Center at Kennesaw State University, for his assistance with this article.